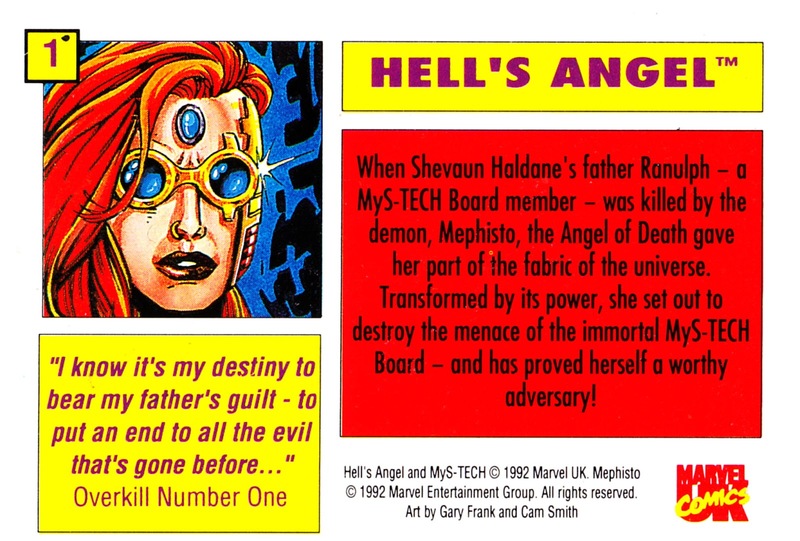 One of the many must-have fads to infect comics in the early 1990s (along with pricy cover-enhancements and silly cardboard discs) were trading cards. 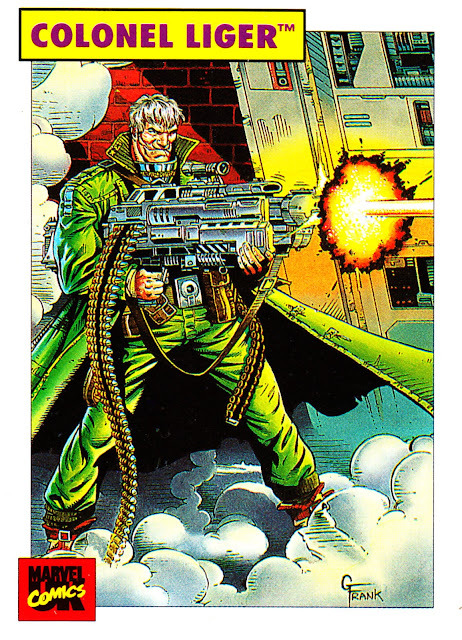 Possibly better known as bubble gum/ chewing gum cards. Except without the mysterious pink food stuff. Publishers used polybagged cards (Don't. Open. The. Bag) to boost sales (better buy a few more copies!) 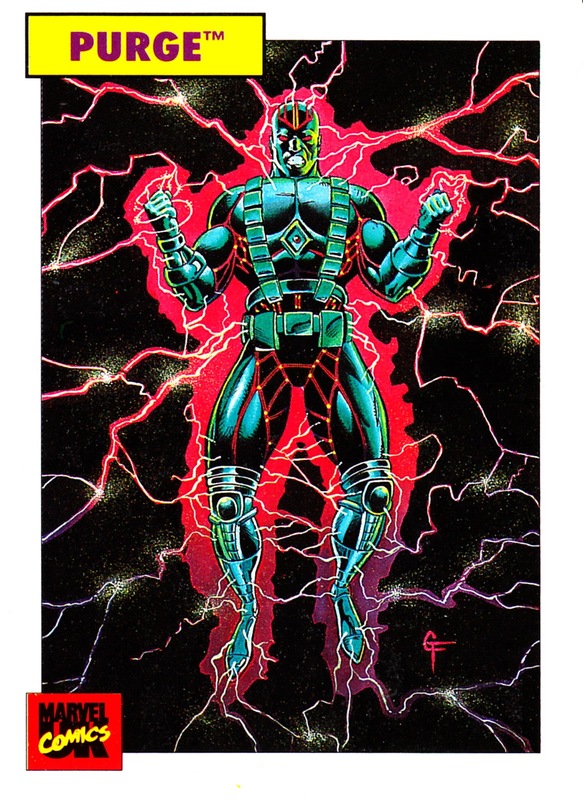 and cross-promote separately-sold card sets. Jim Shooter's Defiant Comics took the whole fad to its logical conclusion with WARRIORS OF PLASM* issue "0", a "comic book" entirely assembled from trading cards (folder sold separately). 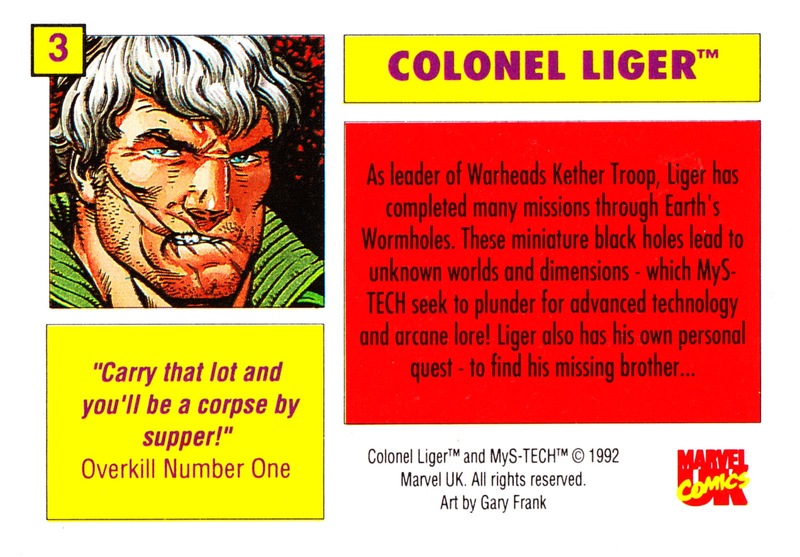 The ultra-expansionist Marvel even snapped-up the two big players in the trading card business, Fleer and Skybox, to corner the market. And sold them both, at a loss, a few years later. Meanwhile, long-established card people Topps briefly expanded into the comic book business. 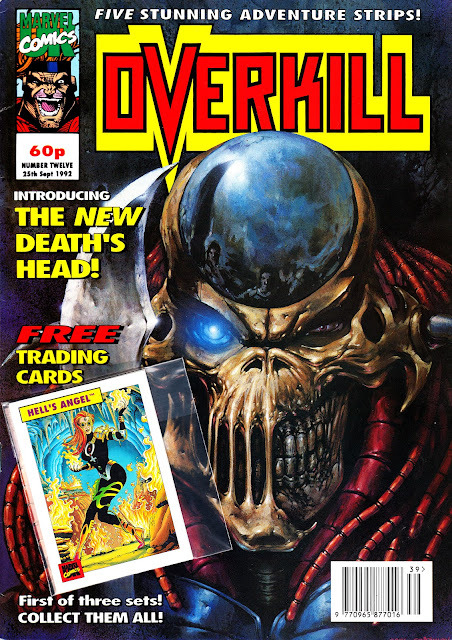 MARVEL UK's fortnightly OVERKILL (the British manifestation of the Genesis 92 line) got into the act with a set of cover-mounted (in a little, unsealed, plastic bag) cards, illustrated by Gary Frank, free with issues 12-14. 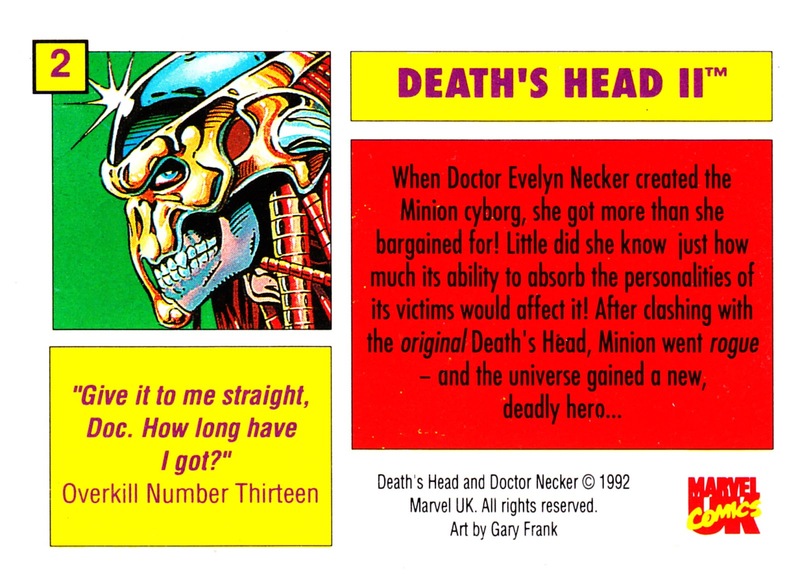 Marvel UK published a few more freebie card sets (a 3D set for later issues of Overkill and individual cards polybagged with some of the US titles) but never had a chance to produce their own full set. 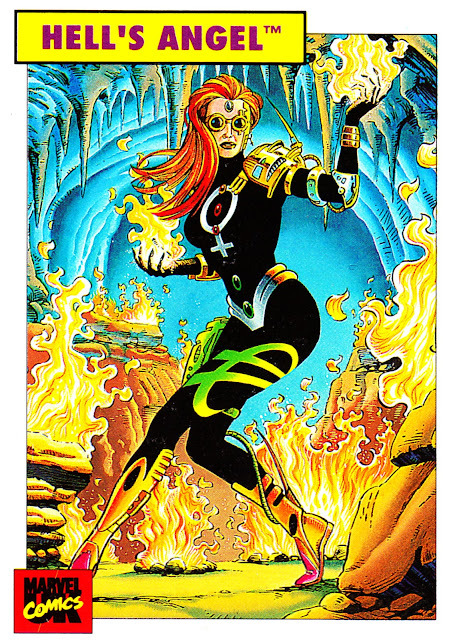 A set of original Spider-man-themed cards were presented free, also as a cover-mount, across several issues of THE ESSENTIAL SPIDER-MAN around the same time. Needless to say, Marvel New York pretty much ignored the British characters and, with the exception of Death's Head (featured in a previous Starlogged post), didn't feature them in US card sets. Over the next few days, I'll post a complete set of the Overkill cards here. I've presented them larger than their original size to really showcase Frank's art. 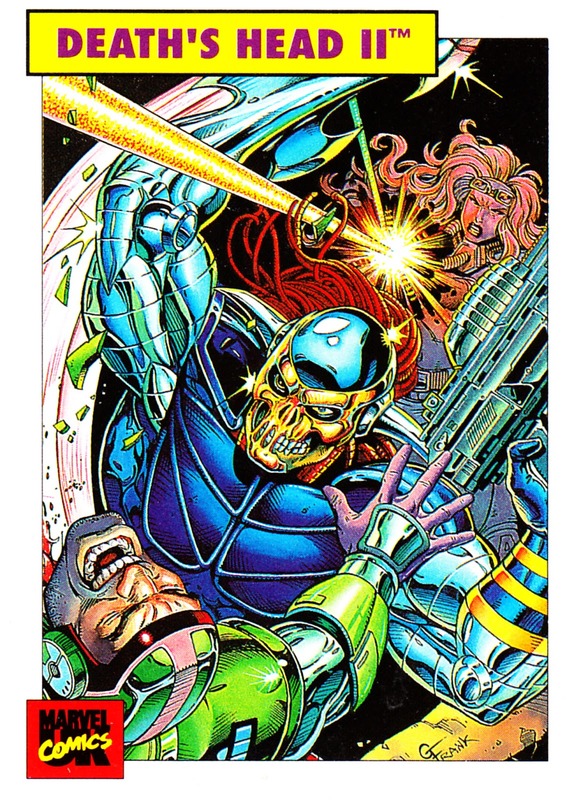 * Shooter originally announced his new comic as PLASM which - instantly - incurred the wrath of Marvel's lawyers who claimed copyright infringement. 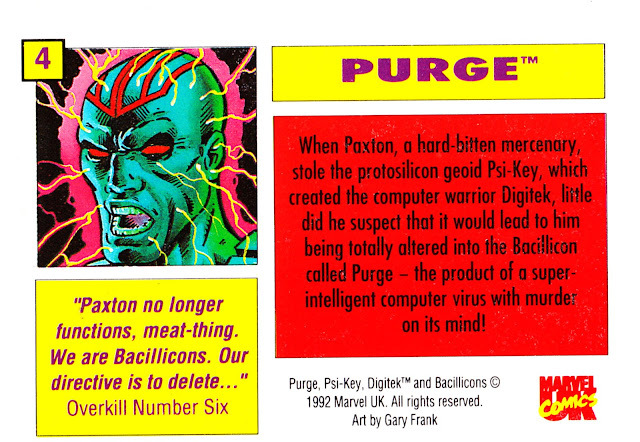 Their complaint: That readers might confuse it with Marvel UK's PLASMER. After burning through a shed-load of monies, and a slight name change, Shooter's outfit won out.